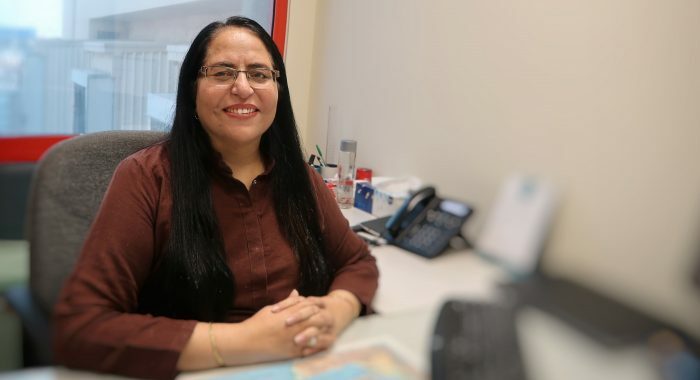 Over 26 years ago, Urmil Madan joined the BMMI team as a trainee, never expecting that a temporary position would grow into an almost three decade career. As the group’s business expanded over the years, so did her ambition, development and loyalty. Today she is the Administration Manager of BMMI’s Supply Chain and Logistics, overseeing services for a number of our diverse and evolving businesses. What was it like when you first joined BMMI? I joined the Finance team in February of 1992 for a six-month contract, as a fresh graduate with a degree in accounting. When an opportunity opened up in another division, I was recommended for the role and took it on. It was a challenge for me because I was very fresh and had no experience. Looking back, I appreciate that I had to quickly learn many things. It was a hands-on learning experience and motivated in me a self-driven, learning-by-doing attitude. We were a very small team, and the work volumes were high, but I was always excited by the momentum. Around two and a half years later, I then moved again, this time to our FMCG division, Nader Trading. How did your role develop then? Back then, I used to work with administration and warehousing, but our Logistics department as we know it today came into being in 1997, when we moved to the new offices of what is now our Sitra headquarters. It became a centralised operation, with the Beverages admin team also joining the FMCG admin team. The business continued to grow tremendously. Besides FMCG, and Beverages, we were also getting third party businesses and contracts in our newly built, state-of-the-art warehouse. You need to keep in mind that BMMI was one of the pioneers in logistics and a lot of us were learning many new things, fast. Together, we were exploring, developing and achieving a lot in this new field. It was a lot of hard work! We had to set up product masters, understand new systems, deal with suppliers and shippers, and handle much higher volumes. Now, we’re dealing with our various FMCG brands, beverages, third-party logistics (3PL), e-commerce, procurement, shipping and more! Our days are extremely busy because we have several requirements and hurdles that pop up from time to time that we have to sort out from all angles. Keep in mind that we have to deal with health requirements and customs, answer to principals, create reports, abide by our international standards and make sure that stock is available on time. I still find it all very exciting because no two days are the same. Did you always plan to stay in BMMI for so long? I honestly never thought I would reach where I am today, nor did I have specific plans that I was going to stay this long. But as the days went by, I kept progressing. I developed a lot in terms of both my professional and personal life. To me, logistics was a totally new field and I still believe I am learning every day because it is such a rich industry. I always remain curious to learn every single thing I can! I found BMMI to be the place for me, from all sides. The work satisfaction is incredible, so are the opportunities to learn, our culture, our advanced policies, and I’ve always received support from management and colleagues. For me this is the only company - my first and last. With all I’ve learned, and how much I’ve grown, I can’t imagine working anywhere else. Do you ever think of getting into a new field? Honestly, I fell in love with logistics! There’s just so many opportunities and challenges. It keeps us busy and we’re on our feet all the time – that truly gives us a push. Every day, we have something to sort out. It’s not just limited to one area as well, so I never get bored. Witnessing the development of our logistics capabilities is also a great motivation. We started out small, but now we have superior warehousing, systems, procedures, equipment, KPIs and international standards under our Integrated Management Systems. BMMI is unique with what it offers in supply chain and logistics. We’re one of the pioneers in the field and as the group’s businesses continued to grow, so did the requirements and abilities. Each of our divisions has its own unique needs, and there’s a lot of knowledge and technical understanding that goes into that. Logistics is like the engine of BMMI, because without it, we cannot operate or achieve our goals. We’re always on call and always ready to go. It’s a high energy and active role. As a team, that gives us a bigger sense of responsibility and motivation. You’re in a senior position in what many people describe as a male-dominated field, what are your thoughts on that? Well, when I first started, I was the first woman to work in the warehousing and admin team of BMMI, and there used to be some questions about ‘how will she handle it?’ But I took it as a challenge and I thoroughly enjoyed it. I used to go down to the warehouse a lot to understand the products. I used to physically check them and I used to participate in a lot of stock takes. I used to get into the forklift cage and count products. With the passage of time, although some more women joined our team, I used to be the only woman there with all the men for the majority of the time, but it never felt odd. I felt like I was with family, and the team made me feel that way, always helping me to learn. Today, our teams are much more diverse, not just gender wise but also with nationalities, representing how inclusive BMM’s culture truly is. You mentioned that BMMI’s culture was one of the reasons you stayed, can you elaborate? Our culture is unique. First of all, personally, I’ve always felt a lot of equality and respect for each and every person. I’ve never experienced any sort of discrimination. To me, BMMI has soul, and I feel it all around me. Our management understands that we’re people, and not just workers. Whatever our role is, they understand our needs and that’s what makes BMMI different. I’ve also had a lot of support for training and development, not just in logistics, but in other things too, such as being an internal auditor, for example. It’s a great culture to grow yourself in, if you take on the opportunities provided to you. I also try to live our Winning Hearts values every day and instil them in others. I was actually part of the team that helped develop the values and I truly believe in them. As a long serving and vital employee of an organisation, do you have any advice for those beginning their careers? I think it’s really important that for anyone about to enter the workforce, or even join a new field or industry, to come in with the right mind-set, and that is that they have to work from the ground up. Because only then will you continue to rise sustainably and learn your field from A to Z. Don’t limit yourself and say you can’t do something. Always think that if someone else can do it, you can learn to do it too! Self-development is also crucial, you must push yourself and continue to learn. You will have mentors along the way, but some of the best learning comes by doing the work, putting yourself out there and trying your best. As they say, hard work does not go unnoticed!